When fourth-year biochemistry student Andrew Trapsi isn’t in the classroom, he’s an active participant in Chaminade University’s Campus Ministry. From attending retreats to feeding the homeless to volunteering at a local fishpond, Trapsi has discovered his role as a community servant through the teachings of Chaminade’s Catholic Marianist values. This academic year, Trapsi was one of 209 Chaminade students to receive scholarships funded by generous donors, which totaled to $2.4 million. Chaminade manages more than 100 donor-funded scholarships offered to student-athletes and those pursuing degrees in nursing, education, biology, criminal justice and counseling psychology. 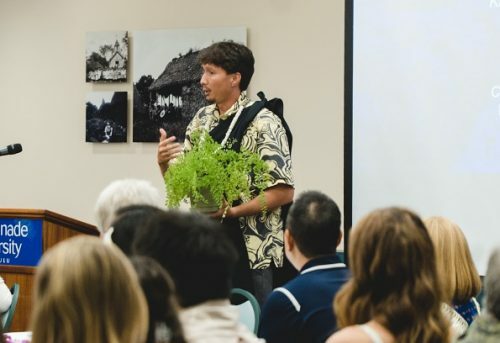 To extend a personal thank you, students welcomed their scholarship benefactors to the university’s annual Mahalo Scholarship Luncheon held on Feb. 8 in Clarence T.C. Ching Conference Center. 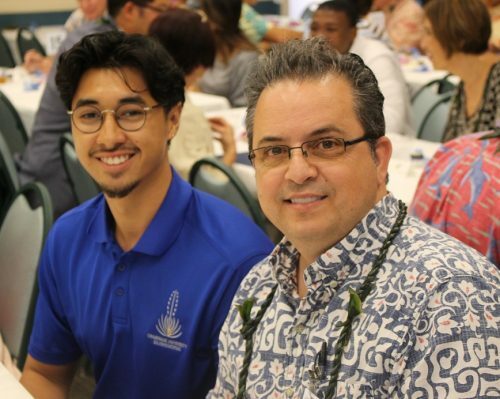 Among those in attendance were 74 student recipients of donor-funded scholarships, faculty and donors including representatives from Kamehameha Schools and The Clarence T.C. Ching Foundation. There, students got the opportunity to get to know their donors, share about their experiences at Chaminade and most importantly, express gratitude. The program included motivational speeches from donor and alumna Millicent Perreira-Gilmore, accounting professor Wayne Tanna and chosen student speaker, Trapsi. 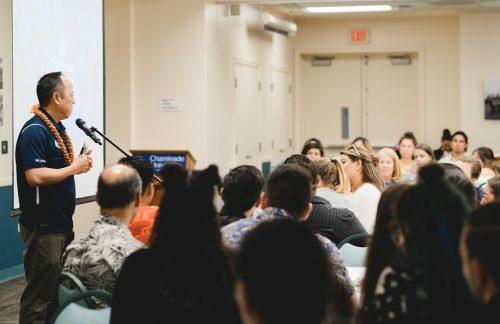 HONOLULU, HI (December 26, 2018) — Chaminade University has launched two STEM scholarship opportunities for students. The Ho’oulu STEM Scholarship, a partnership with Kamehameha Schools, offers 100 percent tuition assistance for four years. TheNational Science Foundation S-STEM program offers a $10,000 annual merit scholarship for four years in addition to a student’s existing financial aid package. “These scholarships are at the interface of three of our priority areas: affordable excellence, a quality education right here at home and a commitment to the training of tomorrow’s STEM professionals,” said President Lynn Babington. The prestigious scholarships will provide the awardees with an affordable college education in a wide array of STEM program offerings. Both scholarships come with Chaminade’s unique Academic Navigator program—trained faculty advisors that provide support services to promote Chaminade’s four-year graduation guarantee. The scholarships are available on a suite of eligible majors: Biology, Biochemistry (including Pre-Med students), Forensic Sciences, Environmental Studies, Data Sciences, and Business Entrepreneurship. Each year, Chaminade University awards $12 million in total institutional aid. To learn more,visit Ho‘oulu Scholarship Program and National Science Foundation STEM Scholarship Program. 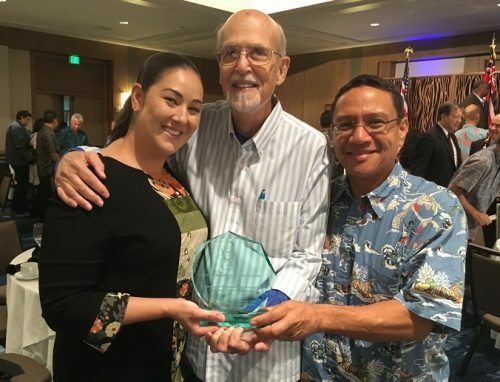 On October 25, the Chaminade University Criminal Justice Program received the Outstanding Organization Award at the Top Cop Hawaii 34th Annual Law Enforcement and Security Awards Banquet. Each year, The Law Enforcement and Security Coalition of Hawaii presents the award to a security or safety organization or professional association that demonstrates initiative and innovation in promoting law enforcement, security and safety in the State of Hawaii. Chaminade has the largest and most respected undergraduate criminal justice program in the state of Hawaii, and the only master’s degree in criminal justice. Chaminade graduates can be found in law enforcement agencies throughout the state as police chiefs, correctional agency directors, government attorneys and federal, state and county law enforcement personnel. The ASIS International Hawaii Chapter and Cindi Flating also presented two Chaminade students with the Bob Flating Scholarship at the event. The award is given each year to individuals who are pursuing a degree in law enforcement or security. Both Sydney Thyen and Yaron Fernando received the $1,000 scholarship to use toward their course tuition. Nerisa Taua doesn’t believe in waiting for opportunity to come knocking, it’s time wasted. Instead, she hunts it down. Taua – who will graduate from Chaminade University in May with a bachelor’s in Environmental Studies – has knocked on a few of opportunity’s doors during the past four years. On the academic front, she found her true passion through Chaminade’s Summer Research Program. While other students soaked up the sun, Taua spend her summer at Purdue University collaborating with experts in the university’s bat lab. Alongside Associate Professor of Wildlife Science Patrick Zollner – who became one of her mentors – she was able to get up close and personal with long-eared bats. Using acoustic monitors and echolocation, her research involved finding efficient and cost-effective ways to capture the animals. With graduation on the horizon, Taua dreams of returning home to American Samoa to research the fruit bat, one of the country’s few native mammals. But before she does, there’s another stop on her journey before she returns. She’ll be making a round trip back to Purdue University to further pursue her newly found passion at the graduate level, seeking a master’s degree in the Wildlife Science program, and continue working with Zollner and his team. Paying for graduate school is never easy, but the cost for Taua isn’t a factor. Again seeking out opportunity, she found the Sloan Indigenous Graduate Partnership grant and applied for its scholarship program. Taua was accepted, she is now a Sloan Scholar. Although she’s been busy with her studies during her time at Chaminade, Taua has kept her culture alive in her heart and shared it with other through her experiences performing with her brothers and sisters of Lumana’i O Samoa. There’s been personal growth as well and Taua says she’s grown immensely during her time at Chaminade. She now considers herself to be better at public speaking, more social, open-minded, approachable and professional. It takes a village – and an enthusiastic cheering squad – to raise a child and Taua found hers since arriving in Honolulu four years ago. She’s has a team of dedicated and caring professors, advisors and staff encouraging her success and guiding her to individualized opportunities. Taua leaves Chaminade with many great memories. She says she’s humbled and honored with the opportunities she’s been provided and that she’s proud to represent her home, family and those who’ve helped her along the way. Now she wants to give back to others as a mentor to help them grow and succeed in the ways she did. She especially wants to channel her energy toward the youth in America Samoa. When Taua leaves Chaminade with her degree in hand, she’ll take with her a world of experience and lessons. She’s built a solid foundation at Chaminade and this is just the beginning. The Environmental Studies minor offered by the Division of Natural Sciences and Mathematics focuses on policy and environmental law to prepare students for careers in environmental science, ecology and conservation biology. The Office of Health Professions Advising and Undergraduate Research (OHPAUR) assists students interested in healthcare careers, regardless of their major. Services include: advising, test preparation, summer programs, guest speaker presentations, professional seminars, community service activities and internship/shadowing opportunities. OHPAUR also maintains articulation agreements with four ATSU campuses, as well as Boston University School of Medicine, George Washington University School of Medicine and Health Sciences, Pacific University, Samuel Merritt University, Tufts University School of Dental Medicine, University of Dayton and Western University School of Health Sciences. Some college students simply go to class and go home. Not Antonio Bonnetty. This Chaminade University undergraduate is double majoring in Environmental Studies and Criminology and Criminal Justice, he runs cross country for the Silverswords, he represented Chaminade Athletics at a leadership retreat, he’s involved in Campus Ministry, he’s part of the Hogan Entrepreneurs Program, and in his spare time he’s into slam poetry, hiking and Xbox One gaming. A double scholarship winner, Bonnetty also plans to join the Peace Corps, become an environmental law attorney and possibly pursue an FBI career. “I have been very blessed at Chaminade thus far and have taken part in many opportunities as a result,” said Bonnetty, a “military brat” from Mississippi whose family moved to Oahu during his junior year of high school. Bonnetty said all his instructors “have been extremely helpful in my success.” But he’s especially grateful to Associate Professor and Environmental Studies Director Gail Grabowsky for underscoring the danger of ecological threats confronting Hawaii and the rest of the planet. “Professor Gail ignited my love for environmental issues and led me down a path that impacted me so much that I realized that wanting to change the way the world views the environment, while not easy, is something I would be willing to spend my life in the pursuit of,” Bonnetty said. This dedication to protecting the global ecosystem prompted Bonnetty to work with Kupu, a Honolulu-based nonprofit organization that provides young people with internships and service-learning opportunities so they can become stewards of Hawaii’s culture and natural environment. Another instructor who stands out for Bonnetty is Professor Ronald Becker, director of the Criminology and Criminal Justice program. Dr. Becker also leads the five-day Underwater Forensic Investigation Workshop, which explores methods of locating, recovering and processing submerged evidence at crime scenes. “These are things that I am so blessed to be a part of,” Bonnetty said, “and I will take a piece of what I learn from each experience into my future endeavors. Chaminade University offers a Bachelor of Science degree in Environmental Studies, which prepares students for careers in fields such as law, economics, communications and information, consulting, science, ethics, health and environmental policy. Graduates of Chaminade’s Criminology and Criminal Justice Bachelor of Science program pursue careers in law enforcement, public safety, administration and other areas at the federal, state and local level.